The role that educators play in our lives is immeasurable. It is from them that we learn not only the basics of reading, writing, and arithmetic, but also the concepts of discipline, ethics, and play. They teach us about compassion, sharing, and ambition, and what is takes to reach our goals offering guidance along the way. Filled with inspiring, true stories, For the Love of Teachers is a tribute to those whose dedication to education reigns supreme, whether simply for the summer vacations or the shortened workday. May these stories inspire a new generation of teachers to pass on the lessons they have learned, or may they reignite the passion of the tenured few. Some stories are warm, humorous, and heartfelt, while others speak of the sacrifices and challenges faced by educators and students alike. Although the path can be difficult and unexpected at times, many will agree that the true reward for teaching lies in the aha moment—that specific point in time when everything becomes clear and understood. 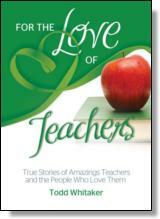 For the Love of Teachers is the ideal way to express the admiration and appreciation we share for getting us there. Teaching is a profession that makes a difference every single day—on both sides of the desk. Virtually all of us can remember the kindness, caring, and humor of the special people who taught us when we were their students. Many of them shaped our minds and touched our hearts. Their impact was immeasurable and ongoing. No matter how old you were or what grade you were in when you connected with that special teacher, you know that the unique gifts a great teacher shares stay with you forever. Do you recall how you felt when your favorite teacher read a thought-provoking story to your class? Do you remember the teacher who taught you how to multiply when you were so frustrated you wanted to give up, or the teacher who knew when you needed encouragement, or the one who gave you breathing room when you needed just that? The 'special something' these teachers possess continues to remind all of us in this profession why we chose to be educators ourselves. Unfortunately, many students come from homes where there may not be a stable environment or a consistent and positive role model. Many times, teachers are these students' last and best hope. It is essential that each child walk into a classroom—every day—to the teacher who inspires by example. Education's goal is to cultivate society, not to reflect it. We have to teach and model new and better ways each day in our classrooms. A teacher's influence can last a lifetime. We all chose a career in education for different reasons, but we share the common desire to make a difference—yet some days we lose touch with that initial passion. Sometimes, when we have a challenging day or face a troubling class, we may forget the difference we can make for each and every student. On those days, you'll find the stories in this book to be a treasure trove of inspiration and innovation. You'll be motivated to try other teachers' novel techniques as you read about their challenges, their memorable students, and the times they knew they made an impact. You'll walk into the classrooms of some of the most gifted and caring educators in the world, and share their memories of humorous happenings and poignant moments. You'll delight in the recollections of some of those students themselves, and you'll learn from the mentoring advice of some special experts whose best teaching tips will resonate with new and experienced educators alike. A very wise person once told me, 'Those who can, teach. Those who can't go into a much less significant line of work.' Good reading and thanks for making a difference. Every year I bestow a unique award. I never plan to give it; I never know which student will earn it. I call it the Soul of a Poet Award. This award's inception began almost two decades ago, during student teaching. As a student teacher, I found it difficult to reach struggling students, especially in the critical subject areas of reading and writing. Understandably, they feared taking risks or making mistakes in front of their more capable, and sometimes quick to taunt, classmates. Jake was one of my first challenging students. An underachiever who had been plunked inappropriately into a 'Gifted and Talented' fourth-grade class, Jake struggled daily to keep up with his precocious classmates. In a room overflowing with -overanxious hand-raisers, Jake remained sullen and silent, until the day we picked up our pencils to pen a bit of poetry. Not surprisingly, half of the class responded with a collective groan. They were, after all, nine- and ten-year-olds. Their ears perked up a bit upon learning that their responses and accompanying artwork would be submitted for possible publication in the local newspaper for Valentine's Day. As I wandered around the room monitoring their work and commenting with a perfunctory 'Good job!' or 'Nice work!' I happened to glance down at Jake's paper. He cautiously glanced up at me. The words, penned in crayon, sprang out of a giant red heart. I stifled my first reaction. I had specifically stated that the words must be written in pencil. Jake, once again, neglected to follow directions. But I resisted the urge to admonish him for writing in crayon, especially on an assignment headed for the newspaper. Apparently the newspaper editors agreed, for when I opened the Valentine's Day issue, Jake's declaration of love burst right off the front page of the Features section. I finished student teaching not long afterward to begin my solo teaching journey, packing away more than just books and papers as I left. I have found that through poetry writing and personal essays, students face fears, examine prejudices, and overcome personal obstacles. Annually, my students write poems about Martin Luther King Jr., Ruby Bridges, Johnny Appleseed, favorite book characters, their families, and themselves. Children respond with gut-wrenching honesty and heartfelt integrity through writing. Even the shiest students scamper to the circle to share their individual thoughts. Year after year, my Soul of a Poet Award is bestowed upon a most unlikely candidate. This past September, Mark rocketed into my second-grade classroom. Angry, defiant, torn from his father's home, his friends, and the only school he had ever attended, Mark opposed any form of structure. My numerous and previously effective behavior-management tricks folded as he systematically played his hand. Parent phone calls, trips to the principal's office, recess detention—nothing fazed Mark. Bright but underachieving, Mark challenged authority at every turn. In my two decades of teaching, he held the dubious distinction as my most frustrating student. Slowly, very slowly, we established a tenuous bond. As the year progressed, Mark continued to press every nerve while simultaneously stealing my heart. Daily, he filled me with frustration and pride. Writing seemed to allow Mark to release some of his anger and frustration in a healthier outlet. Over time, I noticed a gradual, positive shift in his behavior. When asked to write what was bothering him, Mark first just scratched the surface, but, as the year went on, he placed his problems on paper rather than trying to solve them with inappropriate words or physical contact. Although I have witnessed this kind of constructive conversion with other difficult students, Mark's transformation encouraged and amazed me. The bio-poem the students publish for open house at the end of the year remains my favorite. The format allows the students to expose their innermost thoughts and feelings. Every year I'm awestruck by the maturity some second-graders possess and project in their final poem about themselves. As Mark and the other students wrote, they asked me to spell words for their student dictionary. Mark asked for several words, each one more thought-provoking than the last. I told him I was anxious to hear his poem, knowing he had selected several 'hundred-dollar' adjectives. We gathered in our circle to share our prized poems. Mark waved his poem in my face like a checkered flag at a NASCAR race. It seemed to torture him to wait his turn, but once he began to read, I understood his sense of urgency to share. ©2013. Todd Whitaker. All rights reserved. Reprinted from For the Love of Teachers. No part of this publication may be reproduced, stored in a retrieval system or transmitted in any form or by any means, without the written permission of the publisher. Publisher: Health Communications, Inc., 3201 SW 15th Street, Deerfield Beach, FL 33442.